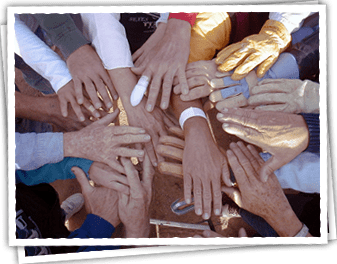 Our vision at Riverbend Family Ministries is to provide resources for smaller non-profit organizations to work together under one roof, providing families and individuals the tools they need to be self-sufficient. We concentrate our collaborative, holistic efforts on children, youth and families who’ve experienced trauma, most often due to violence, addiction, poverty and homelessness. RFM provides resources and training for smaller non-profit organizations in the Madison County area. They work together under one roof, providing families and individuals the tools they need to be self-sufficient. Their collaborative method focuses on holistic efforts for children, youth and families who’ve experienced trauma, most often due to violence, addiction poverty and homelessness. Grand Opening March 20, 2008. RFM opened its doors in August 2007 downtown Wood River at 131 East Ferguson Avenue. About a year later, they held their grand opening & ribbon cutting to celebrate the completion of their construction. Iskarous says, you may not see the difference, however know you’re making a difference. It’s because of all our volunteers, donors and employees that we get the privilege to do what we do everyday. Our goal to provide strength and support to those in crisis. Be blessed and may all we do continue to be for the praise of His glory. We are passionately committed to helping build strong, healthy families. We value that all people come to reconciled relationships, living out restored, transformed and loving relationships between God, themselves, their homes, their community. We will be genuine in all areas of our lives. We were founded by volunteers and are still a volunteer driven organization. Volunteering helps build organizational strength and at RF M volunteers are our most valuable resource. We want to be effective in all areas of service at Riverbend Family Ministries. We want to make an impact on people that will last a lifetime. We want our messages and approach to fit the specific needs and concerns of those whom we serve. We will constantly strive to relate directly to people and the circumstances that they are faced with everyday. We believe excellence and transparency honors God and inspires people.